Convention is a subject of Schutter’s work. He interrogates paintings from the past, spending long periods of time in close proximity to them. Later, returning to his Chicago studio, Schutter re-enacts – on a like-sized canvas of his own – the ‘original’ painting he has since internalised. A selection of Dutch and French paintings from the seventeenth to nineteenth centuries, held in collections in Chicago, Edinburgh, Copenhagen and Berlin, provided the starting point for the work in ‘Rendition’ at the Logan Center Gallery (2013) and ‘What Is Not Clear Is Not French’ at Rhona Hoffman Gallery (2014). These paintings are both the product and performance of a phenomenological working process through which Schutter explores the perceptible archeology of art objects while also charting his own changing condition as viewer and practitioner. The direct correspondence with art history might suggest either homage or annihilation, but it is neither. Rather, Schutter’s practice is a relational one, in which multiple agencies convene at the site of his painting: the referent object, the evidence of the historical artist, the institutional context and the artist’s own presence. With this dense gathering, in which so many marks and remarks are exchanged, it is little wonder that the paintings themselves are thick and grey. Through his use of colour, rendition, and painting-as-painting’s subject, Schutter finds himself in the lineage of Jasper Johns, whose current exhibition at the Museum of Modern Art, New York, ‘Regrets’,3 is based on a 1964 photograph of Lucien Freud, taken by John Deakin and referenced by Francis Bacon in his own work.4 Both Johns and Schutter find vital fellowship with painters from the past and, through their artistic practices, offer new ways to commune with them. Schutter’s exhibition title, ‘What Is Not Clear Is Not French’, offered a linguistic analogy for the communicative possibilities of painting. The use of this quote from the eighteenth-century French writer Antoine de Rivarol, who argued that the French language should stand as the lingua franca for all of Europe, suggests that a parallel syntax of French painterliness – the descriptive, material touch found in the works of Watteau, Chardin, Corot, Manet, et al – forms an equivalent common language in the visual arts.5 De Rivarol’s claim is ridiculous in its hubris and chauvinism, but perhaps finds its saving grace in its hope for an enlightened universality of communication. In the twenty-first century, where we find ourselves beyond universalisms of any kind, what currency remains in the shared, though complex, language of painterliness? A painting of a painting could swiftly cancel itself out in becoming jokey, solipsistic, or boring, especially one that eschews spectacle, narrative and chroma. A painting of a painting could swiftly cancel itself out in becoming jokey, solipsistic or boring, especially one that eschews spectacle, narrative and chroma. Schutter’s grey tableaux escape this fate by, perhaps inadvertently, appearing found rather than made. 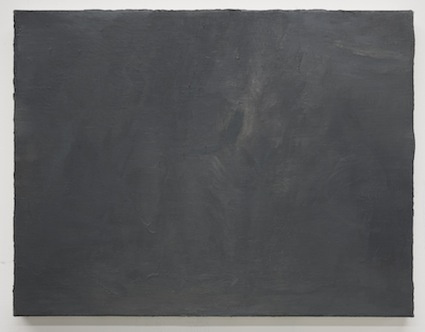 In their refusal to be understood as either a copy of an original, or a subjective expression from Schutter himself, they are independent of the process that made them, and resemble everyday objects that could have been pictured inside the original works: a mercury-backed mirror, a sooty chimney, a seaside mudflat, a slab of slate. This is surprising for many reasons. The discourse around Schutter’s practice focuses on questions of contemporaneity and historicity, and sometimes outweighs the materiality of the paintings themselves. The artist, too, directs us away from their facture through the titles he ascribes to them, acronyms that identify the original referent art object through the names of its artist and home institution, as well as the room number in which it can be located. The impulse to decode a title’s taxonomy distracts from the sensual experience of looking at the painting that hangs before our own bodies. The oil on linen AIC C 224 3 (2013) is oriented horizontally and connotes a landscape. Several brushstrokes appear to sit on the surface of the painting, but even with one’s nose close enough to breathe in the cool, damp oil, it is unclear which strokes are on top of which, as all the layers are alloyed together. A shimmery bluish area in the top left could indicate a sky at dusk, or a darker diagonal swath could represent the trunk of a tree. However, there is no pictorial confirmation. Naming the scale and aspect of the scene is like a Rorschach test, but with no analyst at hand. Perhaps it is through the sensitive, tenuous hard-looking required in the search for landscape that one can begin to feel the effects of outside air on their own body. It is not only that the surfaces themselves suggest the luminosity and sheen of human skin, or that the brushstrokes feel as if they were swept into position by a gust of wind. One is reminded of Robert Bordo’s brushy atmospheres. In his work, and in Schutter’s, there is an odd experience of being both inside the scene – a participant in its greater ecology of climate and matter – while still cognisant of one’s real-time presence within the white walls of the gallery. In another painting, GSMB W 21 (2014), a dark, curtain-like shadow drapes over the top and side regions of the painting, framing a narrow smudge in its centre. 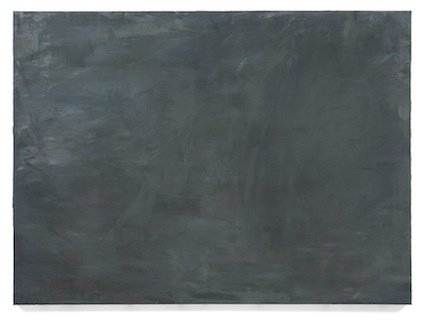 In its shape, scale, and compositional placement, the specificity of this painterly mark breaks ties with its original referent to rhyme with a buoy in a Turner storm, a hole bored through the fibers of a Merlin James painting, the scratched and sutured flesh of Bianca Beck’s surfaces or even the greasy trail left by a finger swipe on an electronic tablet. In all of these instances, the surface elicits a desire to reach out and touch, while at the same time to recoil in defence of one’s own body, creating a visceral connection between viewer, artist, object and depicted space. Perhaps this acute awareness of our own bodies through the material trace of another’s is how we can define ‘painterliness’. Schutter gives an abundance of attention to the paintings he studies, observing the speed and placement of their marks and compositions, as a way to commune with an historical artist through the shared language of paint, inhabiting another’s mind and time while occupying his own. His foggy greys do not conceal the original referent any more than they reveal his own interpretation; rather, they represent an account of their own making, a script of Schutter’s elaborated grammar of looking.